Hogue 08732 OverMolded Combo Kit Shotgun Stock & Forend with 12 LOP Remington 870 Rubber Black in. Hogue Stocks come standard with aluminum pillar bedding. These pillars inserted at critical action mounting bolt locations guarantee an accurate rocksolid action fit that will not shoot loose.The OverMolded shotgun stocks are molded from a super tough fiberglass reinforced polymer assuring stability and accuracy. 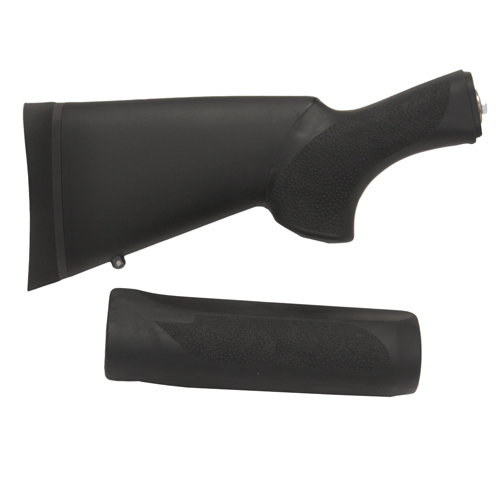 The grip and entire forend are overmolded for outstanding handling characteristics. These superior stocks are durable weatherproof and nonslip. Hogue shotgun stocks are super comfortable with a standard length of pull ambidextrous ergonomic palm swell and a soft recoil cushioning buttpad.This combo kit features a stock and forend with a black finish. It is compatible with Remington 870 12 gauge.